Anna Sui, fall 2001 collection: chiffon caftan over glittery corduroy pants. 1997; introduced first fragrance, Magic Window, and opened Los Angeles store, 1999; introduced jean collection and second fragrance, Sui Dreams, 2000. Exhibitions: Part of the Fashion in Motion series, Victoria & Albert Museum, London, 2000. Awards: Perry Ellis award, 1993. Address: 275 West 39th Street, New York, NY 10018, U.S.A. Websites: www.annasui.com , www.annasuibeauty.com . Steele, Valerie, Women of Fashion—Twentieth Century Designers, New York, 1991. Watson, Linda, Vogue Twentieth-Century Fashion: 100 Years of Style by Decade and Designer, London, 1999. Casadio, Mariuccia, "Anna Sui: Spectacular Ingredients," in Interview, July 1991. Anna Sui, fall 2001 collection: wool knit dress. Goodman, Wendy, "Anna Sui Suits Herself," in House & Garden, March 1992. Allis, Tim, "The Sui Smell of Success," in People, 13 July 1992. James, Laurie, "Sui Success," in Harper's Bazaar, September 1992. Shiro, Anne-Marie, "On Opposite Sides of the Cutting Edge," in the New York Times, 6 November 1992. "Anna Sui," in Current Biography, July 1993. Shiro, Anne-Marie, "Anna Sui Pounds Out the Beat," in the New York Times, 5 November 1993. Foley, Bridget, "Anna's Time," in W (New York), September 1994. Spindler, Amy M., "Saluting—or Doing In—The Suburban Muse," in the New York Times, 4 November 1994. DeCaro, Frank, "Hairy Situations and Hula Baloos: Anna Sui," in New York Newsday, 4 November 1994. Spindler, Amy M., "Cool Rises to Intimidating Heights," in the New York Times, 7 April 1995. "New York: Anna Sui," in WWD, 7 April 1995. Sitbon, Martine, "Oui, Sui!" in Interview, May 1999. Spindler, Amy M., "Behind the Seams," in the New York Times Magazine, 14 November 1999. LoRusso, Maryann, "The Sui and Lowdown," in Footwear News, 26 June 2000. When Anna Sui started her own apparel company in 1980, her mission was to sell clothes to every rock 'n' roll store in the country. "It was right after the punk rock thing and I was so into that," said the designer, who has earned a reputation for bringing a designer's sensibility to wild-child, rocker clothes with a vintage spin. One of three children of Chinese immigrants, Sui knew she wanted to be a clothing designer since she was a little girl growing up in Detroit in the late 1950s and 1960s. She came to New York to attend Parsons School of Design after graduating from high school in the early 1970s—an era whose music-inspired fashion scene, mix-it-up attitude, and free-spirited energy influenced Sui to a great degree. At Parsons, Sui met photographer Steven Meisel—her counterpart in styling ventures then and now. Upon graduation from Parsons, Sui's first job was with the now defunct junior sportswear firm Bobbie Brooks, where she worked as a design assistant for about a year. After working for other firms over several years, Sui landed at Glenora, a firm the designer described as "very hip at the time." There she was able to experiment with her interest in clothing having a historical bent, made modern by mixing fresh colors and new shapes with vintage elements. In 1980, prompted by friends and the praise she received as a stylist for Meisel's shoots for the Italian fashion magazine Lei, she started her own company. Greatly influenced by New York's punk scene of the 1970s, Sui's main focus was on selling her funky styles to music stores, though she continued as a stylist for Meisel. This changed around 1987, when the designer decided to "get serious about being a designer," as she recalled. She moved her line into the Annette B showroom, owned by Annette Breindel, a no-nonsense woman known for nurturing young designers. "Annette helped me enormously," said Sui. "She helped me build my dress business first because that's what she saw as a worthwhile area." Building up her dress category is what allowed Sui to move her business out of her apartment and into a loft workspace in the garment district of New York. 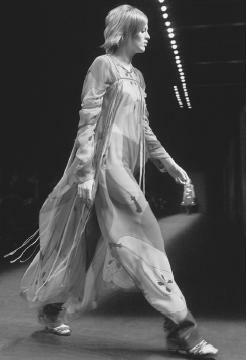 In 1991 Sui staged her first major fashion showing during New York Fashion Week. Her friends—supermodels Naomi Campbell, Linda Evangelista, and Christy Turlington—walked Sui's runway for free, in exchange for clothes. Influenced by the shows of Thierry Mugler and Jean-Paul Gaultier, the designer created a showing that was as much about music and theater as about clothing. She soon reigned as the queen of fashion show extravaganzas. Sui's designs mixed styles and time periods. She explained her creative focus in an interview with Maryann LoRusso in Footwear News in June 2000: "My designs are a combination of nostalgia and trendiness and rock 'n' roll and flea markets. And fantasy and dress-up. I'm a product of American pop culture, and my designs really show that." She is a fanatical researcher with an insatiable desire to learn. She draws inspiration from art exhibits, films, flea markets, museums, music, and street fashion. She does not simply pluck ideas from the past or another culture, but instead pulls together themes from many sources and seeks to relate them to what people are currently experiencing. She understands that her customers want to express themselves through their clothing and not feel as if they were wearing a costume. Sui's business continues to expand; she has over 200 boutiques worldwide, in such locations as New York, Los Angeles, Tokyo, and Osaka, and her collections are sold in many major department and specialty stores. She formed Anna Sui Shoes in 1997, and her cosmetic and fragrance line is now a global brand. Even as her business branches out, Sui's commitment to fashion that is fun to wear hasn't diminished. Her 2001 collection included 59 feminine t-shirts decorated with printed designs, fabric flowers, lace, and sequins, and were as fashionable as they were affordable. Never interested in haute couture, Sui's work reflects her ongoing concern to "continue to make these clothes accessible to the people I want wearing them."